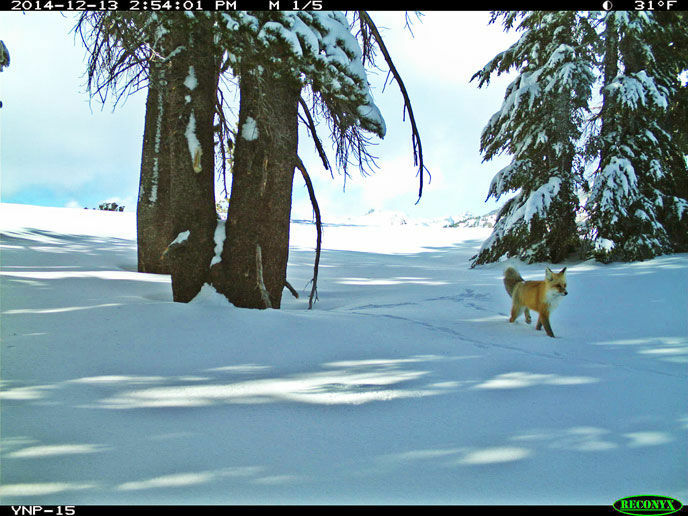 A rare photo of a Sierra Nevada red fox, snapped by a remote camera trap in Yosemite National Park. The elusive and rare Sierra Nevada red fox has been spotted in Yosemite National Park for the first time in nearly a century, park officials said yesterday (Jan. 28). Camera traps caught the sleek animal in a remote northern corner of the park on Dec. 13, 2014, and again on Jan. 4 of this year. The cameras were set up by wildlife biologists hoping to spot the red fox and the Pacific fisher, Yosemite National Park's rarest mammals. The ongoing study is funded by the Yosemite Conservancy. There hasn't been a verified sighting of the Sierra Nevada red fox inside Yosemite National Park since 1916, said Ben Sacks, director of the University of California, Davis Veterinary School's Mammalian Ecology and Conservation Unit. That year, two animals were killed in Yosemite's Big Meadows, northeast of El Portal, for the University of California, Berkeley's Museum of Vertebrate Zoology. Fewer than 50 of the animals may still exist in the wild. The U.S. Fish and Wildlife Service is expected to announce this year whether the fox will be protected under the Endangered Species Act. No one knows for certain why there are so few Sierra Nevada red foxes, said Cate Quinn, an ecology graduate student at UC Davis who is studying their decline. "There is a lot of speculation about the causes, but there is no evidence supporting one or the other right now," she told Live Science. The most popular theories include loss of prey, competition from coyotes, genetic inbreeding and loss of habitat, Quinn said. Biologists think the historical population was always relatively small. In 2010, the U.S. Forest Service discovered another small group of foxes living near Sonora Pass, north of Yosemite National Park, Sacks said. Before that discovery, the last verified sighting near Yosemite was on the east side of the Sierra Nevada, near Tioga Pass, he said. "We are thrilled to hear about the sighting of the Sierra Nevada red fox, one of the most rare and elusive animals in the Sierra Nevada," Don Neubacher, Yosemite National Park superintendent, said in a statement. Sacks records red fox sightings online, and hopes the Yosemite news will encourage park visitors to dig through their vacation photos for images of the mysterious mammal. "There could be backpackers who have personal photos from the 1980s or 1990s," Sacks said. "Someone who has them might not have realized they were important enough to share." Follow Becky Oskin @beckyoskin. Follow Live Science @livescience, Facebook &amp; Google+. Originally published on Live Science.